One of the main purpose of baby teeth is to act as placeholders for permanent teeth. Sometimes a child might lose their baby teeth too early. When this happens and no corrective measure is taken, it might lead to problems further down the line. Even losing a single baby tooth prematurely can mean a costly and time-consuming solution somewhere down the line. 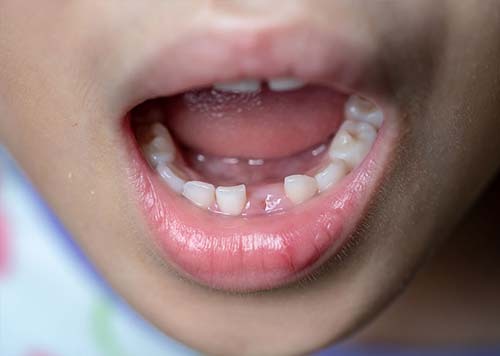 Normally what happens at this stage of tooth development, is that, as the child’s 2nd bicuspid erupts from underneath their second baby molar, the baby tooth slowly dissolves away. In doing so, this process serves two key purposes. Since the second baby molar is held in place till the eruption process is complete, it performs the role of a stabilizer that keeps adjacent teeth in place. It creates a path for the erupting bicuspid to follow thus ensuring that the incoming tooth is held in its proper position. The erupting tooth might become impacted. This means that it might not emerge at all. If for some reason your kid is experiencing early tooth loss, not all hope is lost. There are still things we could do to fix it. A space maintainer is a device that is custom-made by a pediatrics dentist using either metal or acrylic material. It can be either cemented or removable from a child’s mouth. It’s function is to keep the space open to allow the erupting tooth to continue with its progress as well as come into place. By using a space maintainer for your child you’ll be avoiding major corrective treatment later on in your child’s life. Space maintainers are designed to have the band fit around the anchor tooth that the maintainer is cemented on. The band has a bent wire attached to it that holds the teeth whose position need to be stabilized in place. As mentioned before not all maintainers are cemented, some are designed to be semi-attached or removable. Space maintainers are not designed to stay in your child’s mouth for long. As soon as the erupting tooth emerges from the gum, the maintainers will be removed. It might be a while before your kid’s maintainers come off though. This is because if less than 50% of the erupting tooth is yet to form, it will be a while before the tooth emerges. On the other hand, if more than 50% of the erupting tooth has already formed it won’t be long before it emerges from the gum. If you’d like to consult us on the premature loss of primary teeth do get in touch.